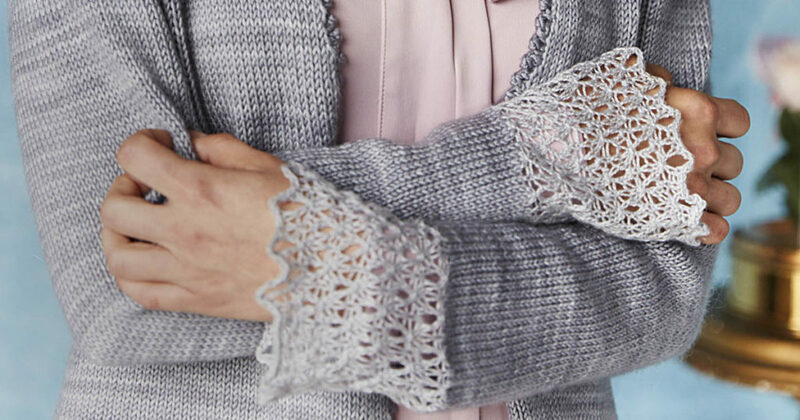 The Ann Veronica Cardigan by Mone Dräger from Knitting Traditions 2018 is that special yarn-splurge project you’ve been waiting for. It’s sophisticated, structured, and fun; plus you’ll love wearing it just as much as you loved knitting it. Mone drew her inspiration from Ann Veronica (H. G. Wells, 1909), a novel about the “New Woman” and the British suffragist movement. In it, Ann Veronica Stanley is a young lady who rebels against her father’s strict patriarchal rules. She dedicates her time to her education and the women’s suffrage movement and her story shocked audiences at the time of release. The Ann Veronica Cardigan brings the Victorian aesthetic to an updated silhouette and is ahead of its time (just like Ann). This piece combines two great yarns from SweetGeorgia (Mohair Silk DK and Merino Silk Lace), who puts out incredible yarns in amazing colors (good luck picking your favorite)! This ensures that the body and lace seamless flow from one to the other, creating a sleek finish. But if you lean towards the adventurous, you can select a different color for the lace to really make it pop. As for finishings, you can add buttons or closures but it also looks stunning as an open-front cardigan. It pairs beautifully with a blouse or dress but it also pairs well with a simple set of jeans and a fitted T-shirt. FINISHED SIZE 32 (36, 40, 44, 48)” bust circumference. Cardigan shown measures 40″; modeled with 7″ of positive ease. YARN SweetGeorgia Yarns Mohair Silk DK (90% superwash Merino, 5% super kid mohair, 5% silk; 218 yd [200 m]/3½ oz [100 g]): silver (A), 4 (5, 5, 6, 6) skeins. SweetGeorgia Yarns Merino Silk Lace (50% Merino wool, 50% silk; 765 yd [700 m]/3½ oz [100 g]): silver (B), 1 skein. NEEDLES Size 6 (4 mm): 24″ circular (cir) and set of double-pointed (dpn). Adjust needle size if necessary to obtain the correct gauge. NOTIONS Markers (m); stitch holders; waste yarn for provisional CO; tapestry needle. GAUGE 20 sts and 28 rows = 4″ in St st with A; 20 sts and 24 rows = 4″ in Lace patt with B. Want to see more beautiful autumnal projects? Check out the rest of Knitting Traditions 2018!